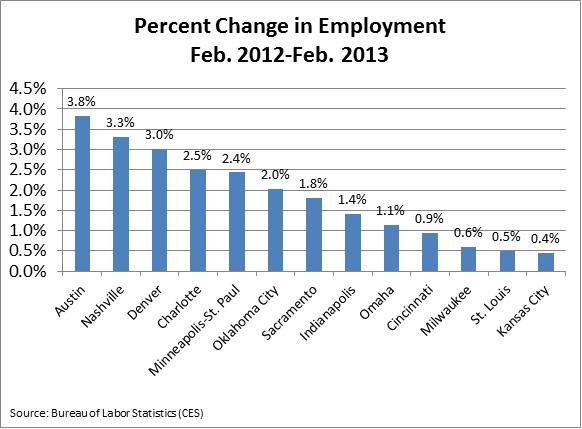 The Bureau of Labor Statistics (BLS) released its February employment figures for metro areas Wednesday. You really need rose-colored glasses to find any positives for the Kansas City metro in this report. The region did see employment growth over the past year (from February 2012 to February 2013), but it was miniscule — just 4,400 net new jobs. The recession, with its years of employment losses, is still fresh in our minds. We are in a recovery now, but where are our jobs? We could take some comfort if we saw this same level of employment stagnation occurring in our peer metros, but alas, this is not the case. Of the 12 peer metros we typically compare ourselves to, Kansas City comes in last in employment growth since last February. So, how can we explain this? 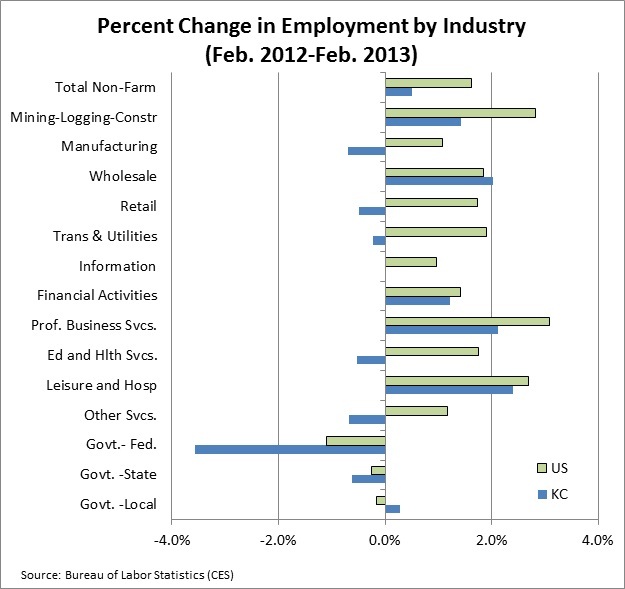 Let’s look at our employment change by industry to see if we seem to be lagging in any particular job sectors. The sector with the biggest decline is federal government jobs. This industry saw declines at both the local and national levels, but Kansas City’s percentage decline was much greater (a 3.6 percent drop, compared to 1.1 percent). In real numbers, employment in this sector declined by about 1,000 jobs locally. The manufacturing, retail, transportation and utilities, and other services sectors all saw slight declines in the region, compared to decent growth nationally. There have been some recent successes in local manufacturing recruitment, and with the recent commitments to Kansas City by Ford and GM we expect growth in this sector to be at least on par with the nation soon. The local mining, logging and construction industry (the vast majority of which is construction employment in our area) grew, but at half the rate of national growth. As we have discussed before, housing construction is starting to heat up nationally. It hasn’t happened quite yet in the Kansas City area, but we are starting to see signs that it might. We see no reason why local growth in this sector won’t look more like the nation’s later this year. The professional business services sector grew by 2.1 percent (3,200 jobs) in Kansas City, but this sector grew 3.2 percent nationally. The education and health industry is perhaps the most puzzling. This sector declined by a half percent (700 jobs) locally but grew 1.7percent nationwide. When we drill down for a bit more detail within this industry, we find that the health and social services portion of this sector added about 1,000 jobs. This means the decline is solely on the education side. It is important to note that this would be private education jobs only. In CES data, public education falls under local government. We’ll keep an eye on this sector to see if this is the beginning of a trend or if this decline was an anomaly. It is evident that the Kansas City region is lagging in terms of employment growth relative to the nation since the end of the recession. But we’ve lagged and led before, so it is too early to say that our economy is in trouble. If the gaps in employment change between Kansas City and the U.S. continue to grow, though, we will have to take a hard look at our economy and see what we need to do to get back on track. And we may have to trade our rose-colored glasses for a bright fuschia.